Woman #1: "She and I are very different. I mean, we reach the same conclusion, and we're usually on the same page, but we sure have a different way of getting there. 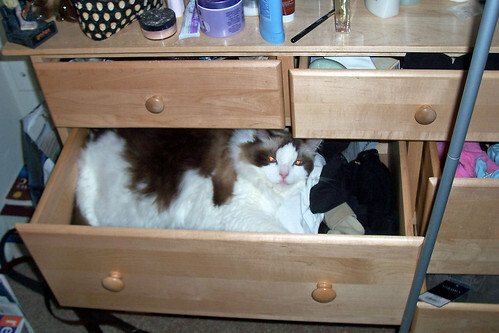 Let's just say we probably have very different underwear drawers." Woman #1: "I'm sure she folds her underwear. Probably displays them according to color, too ... you know, from light to dark. ... Now, myself? I just throw mine in a drawer. I have this drawer in my bathroom that looks like underwear soup." Tomorrow, we will have our guest blogger, Dr. Blunt, talk with us about this. Yeah what is it about cats and dogs and their fascination with human underwear? We had this terrior who always ate any pair of underwear that might be lying around the house. I am totally underwear soup. Life is too short to waste it organizing underwear. I'm certainly drawer number two -- and in fact, I want to be friends with whomever owns drawer number two. I think we are are soulmates. With the spring 2011 arrival, you have like clothes? What to do with Ad?